Can the Sony smart glasses compete with Google Glass? The Sony smart glasses are now up for pre-order and will be officially launched and demoed in March, most likely at the MWC (Mobile World Congress) 2015. What’s surprising about the Sony smart glasses is their price, which is rather high for the developer edition. 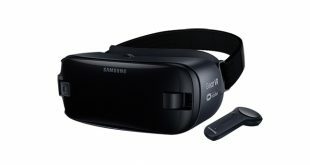 They are still cheaper than Google Glass Explorer, which cost $1500, but they are still expensive compared to Epson Moverio or Samsung VR offerings. The developer edition kit of the Sony smart glasses will set you back $840 if you pre-order now, which is a bit steep for a developer edition product in my opinion. Nonetheless, we are glad to see that Sony is progressing in the virtual/augmented reality field with the new smart glasses. Many have been looking forward to Project Morpheus, but that seems to be a few more months ahead. Instead, the Sony smart glasses, which are transparent and are intended to facilitate an augmented reality experience, replace Google Glass. Google Glass was pulled recently in favor of a new Google Glass project that is already in development and aims to improve the design and features of the augmented reality headset. The Sony smart glasses are called the SmartEyeglass, which is a mouthful, and they bear the model name SED-E1 for the developer edition. They will be released on March 10 2015. The device will connect with smartphones running Android 4.4 and above in order to project an augmented reality interface on top of a real environment, a technology we’ve seen before. Developers in Japan, the U.S., the UK and Germany will be able to purchase the Sony smart glasses in order to develop their own apps for the platform in the future, which is a neat attempt at generating interest in the new device. At the same time, the Japanese company will make the gear available for enterprise customers in Europe. Besides releasing the Sony smart glasses, the company will also make the new and upgraded Software Development Kit available to developers. The device should be made commercially available in 2016, so we still have to wait a bit longer to have augmented reality in our homes. According to the company, the Sony smart glasses are outfitted with a CMOS image sensor, accelerometer, gyroscope, electronic compass, brightness sensor and a microphone. The gear still needs a smartphone to function properly as it will use the GPS within the phone in order to provide accurate navigation information. Sony smart glasses will make use of a monochrome display that will be projected upon reality through hologram optics technology developed by the company, thus reducing energy consumption and assuring long battery life for the device. The glasses are quite bulky at the moment, with the sensor module and controller hanging from the glasses on the side. All of the essential hardware is built into the separate controller, including the battery, speaker, microphone, NFC and the touchpad with which you can control the Sony smart glasses. The display within the glasses themselves has a 419*138 resolution and provides for a 20 degree angle of view. 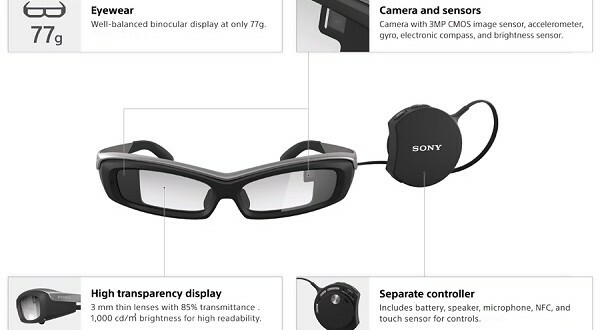 A camera will also be embedded in the Sony smart glasses, although it’s not a very powerful one. The camera sensor measures 3 MP and has video capabilities without sound and a JPEG streaming feature. The battery life of the device is said to max out at 150 minutes of use if the camera is not in use, but if it is, the battery life will drop to a little over half at 80 minutes of continuous use. It’s not much better than Google Glass in this respect, but since we’re talking about a developer edition, we expect the finite product (in 2016) to be improved when it comes to battery life and such.